I HADN'T PLANNED on visiting Texas, until my friend Michael Clayton, design chair and professor at University of the Incarnate Word (UIW) in San Antonio, Texas, invited me to speak to the local AIGA and lead a workshop at UIW. 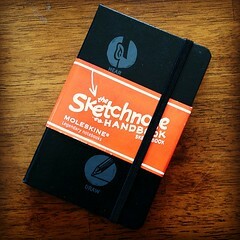 Next thing you know, I was booked for SXSW and partnering with Moleskine. But I had the most fun being able to take my son, Nathan to Texas with me, for his first taste of the bigger than life state. 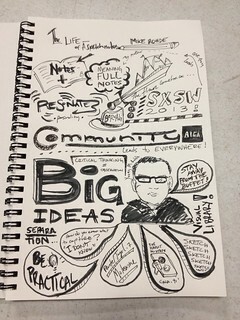 My first event after arrival was a talk on sketchnoting to the San Antonio AIGA chapter. 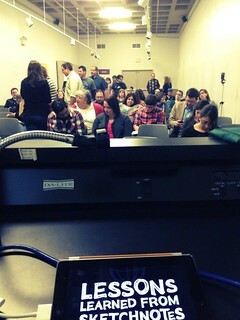 I was honored to speak to a full house — 90 people — at the Southwest School of Art. After my presentation, I was able to sign 20 or so books for attendees and say hello at the same time. 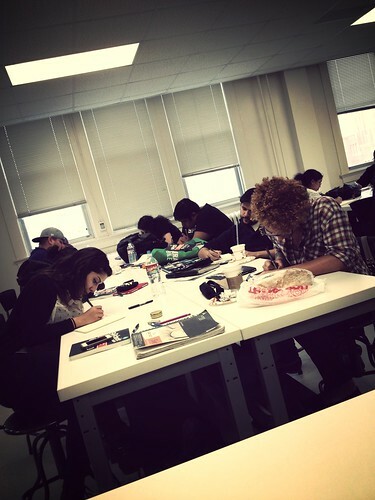 In the morning, I had the privilege of presenting a sketchnoting workshop to 15 of Michael's students at the University of the Incarnate Word. Together, we worked from the basics of sketchnoting to practicing sketchnotes by watching videos and then critiquing work of the students. 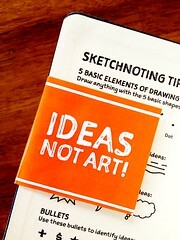 We had a great time and I learned about designing a sketchnoting day workshop later this year. After the workshop, I took time to meet and talk with Sean McCabe, designer and hand-letterer. We had a great time at Local Coffee talking type, our current projects, how we got where we are now and illustration secrets. 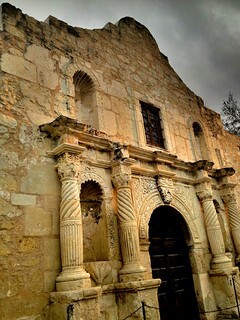 With my work completed, Nathan and had time to explore the San Antonio River Walk, and The Alamo. 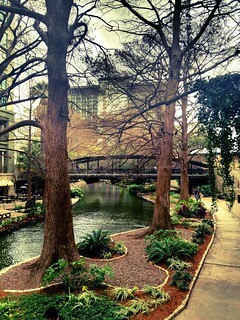 The River Walk is quite beautiful. We capped the night perfectly with BBQ on the River Walk with Michael and his wife, Mindy. On Saturday, Michael, Nathan and I headed North to Austin to get our jam-packed SXSW day going. By the time we arrived in Austin, lines were already forming for parking structures. We were able to find a spot on 6th & Brazos. 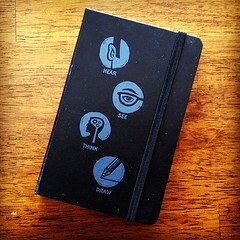 My first event was a Moleskine sponsored meet-up at Jo's Coffee Downtown, where we met with people and gave away custom designed Moleskine Pocket Sketchbooks. We had a good turnout at the busy coffee shop and I had a chance to see friends like Ryan Irelan and Todd Sattersten and meet new people too. At noon I met with a local friend, Keith Pearce, and we all had BBQ for lunch at Lambert's. After lunch, we were off to the Austin Convention Center (ACC) to register for badges and find my green room, to prep for my mentoring session. I was fortunate to meet Elaine Wherry, co-founder of Meebo while waiting for our sessions to start. She was interested in drawing and note-taking, so I gave her a custom Moleskine and a copy of my book. It was cool to share with Elaine. 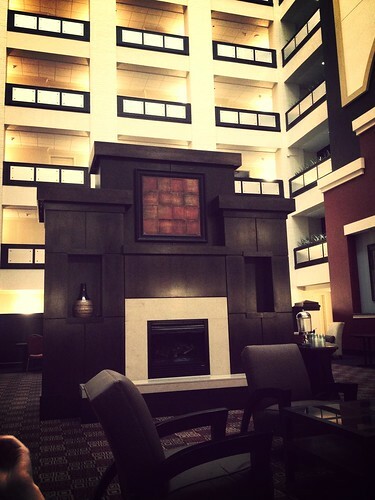 My mentoring session was at the other Hilton hotel a few blocks away, so I headed there with my SXSW guide. After setting up, 2 of the 6 mentees came over (not sure if the other 4 got lost or just bailed out) but the time with the two visitors was great. I had to get back to the ACC for my book reading, so once my session was done, I headed back over and got myself setup backstage, while my friend C.C. 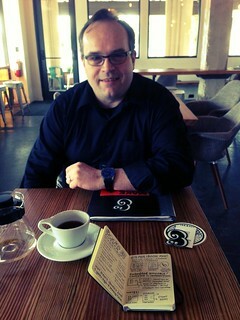 Chapman read from his latest book, Amazing Things Will Happen. After my talk, I met with audience members, then made my way to the book signing table to sign Sketchnote Handbooks at a table near the bookstore. It was great to get to know readers and sign their books in fun ways. It seemed as though I signed 20 or 30 books during my 20 minute window, then I signed a bunch more for the bookstore's stock. I've heard that my book sold 80+ copies at SXSW — Peachpit's best seller! After my book signing, I was interviewed by a film crew from an Alberta university, then it was off to the wrap-up meet-up at Mulberry, to see what fans had captured and to hang out to end the day. I learned that Michael had been wandering around the ACC, giving away custom Sketchnote Moleskines to whomever he saw drawing. The Moleskine promotion went very well. So well, in fact, that I keep hearing for people who missed the giveaway or who weren't at SXSW at all being interested in one of these custom sketchbooks. I think I need to chat with Moleskine. Mike, Nathan and I were wiped out after a day of working hard at SXSW. Back at the car, we crawled in and began the hour trip back to San Antonio, feeling really great about our 3 days promoting The Sketchnote Handbook in Texas. On Sunday, we spent time exploring the San Antonio River Walk, riding on the barge tour and just having a great time together on our last day in Texas. That evening, we hung out with Michael's family before departing for Milwaukee. In-person is important - It's critical to be on the ground, meeting people and sharing your book. I met so many great people, and I believe personal contact really makes the difference. Being on stage to share my story, in mentoring sessions to talk with people, or just meeting folks at the Moleskine events was very rewarding and encouraging. Have something to give away - When I travel I always carry a copy of my book to give to someone. I've given books away in Portland and now Austin, and in every case the recipients are so pleased. I had the double fortune of having custom Moleskines to give away in Austin, and people loved them! Even if it's something small, like a card, it makes a difference. Build in downtime - With Nathan along, I was quite busy. 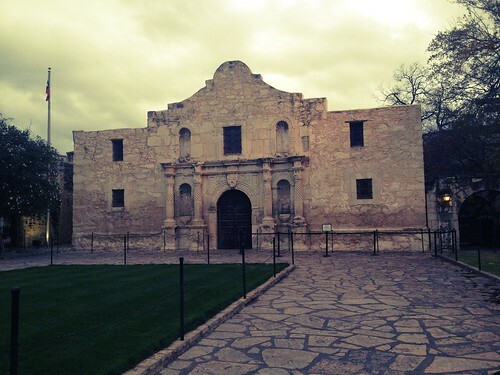 I built in some downtime for us to explore, but the SXSW trip was pretty intense. If I had to do it all again, I would have built in more downtime in Austin. Pack light - This was probably the lightest I've packed for 4 days and it was a great feeling having so little to haul along. Now that I present my workshops and talks only with the iPad 2, I leave my MacBook Pro 13" at home. It's great to do so much with just an iPhone and iPad. 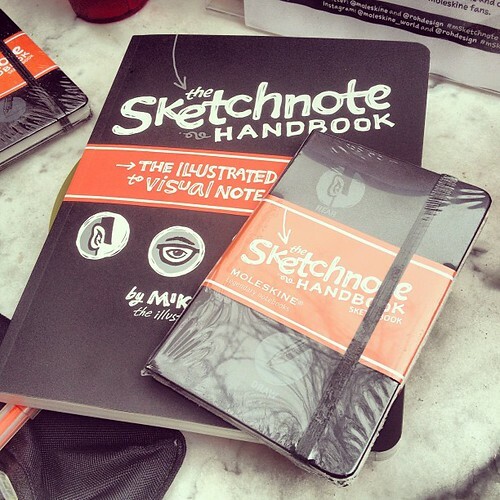 I have a few more Sketchnote Handbook events coming up in the next few months — Judson College in April, Grand Rapids IxDA in May and most likely Minneapolis/St. Paul this June. I can't wait for these events to come now! Greatly enjoyed the recording! I too, can relate with your point about having done something naturally and spontaneously, to the point where it takes effort to explain to others on how you really do it. Thanks very much for sharing the process as broken-down, bite-sized elements, I think that will help a lot. 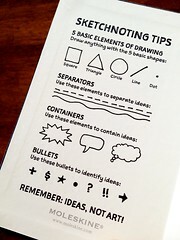 I just ordered my own Sketchnote Handbook (+video version), looking forward to going through it. Thanks Aneesah! I'm glad the talk made sense. I want to put pictures with the audio so it makes more sense too. Enjoy the book and videos and feel free to let me know what you think!